Much has changed since 2015, when irregular migration flows across the Mediterranean spiked, leaving EU and national policymakers scrambling to expand reception and registration capacity, coordinate aid and services, and manage onward movements across Europe. A great deal of learning and progress has taken place in areas such as information collection and sharing, coordination, leadership, and resourcing. Yet officials remain concerned that, should a new migration crisis arise, the European Union may still struggle to respond. In late 2017, the General Secretariat of the Council of the European Union commissioned MPI Europe to reflect on the formal and informal crisis-response mechanisms that have evolved in Europe since 2014. 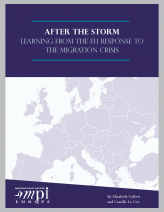 This report builds on that analysis, drawing on interviews and roundtable discussions with senior officials involved in EU and Member State responses to the 2015–16 crisis. It first traces the evolution of the crisis, before breaking down the strengths and weaknesses of the EU response. The introduction of greater flexibility into EU financial systems to ensure the European Union can quickly translate funding into critical supplies and services to support Member States affected by migration influxes. In short, the European Union will need to build out sustainable, resilient mechanisms to manage future emergencies if it is to avoid squandering the progress that has been made in recent years. II. How Did the European Union Respond to the 2015–16 Crisis?